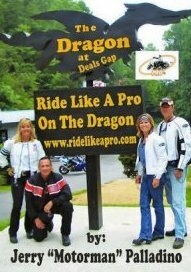 In this video Jerry “The Motorman” Palladino takes his staff to the legendary Deals Gap aka the Tail Of The Dragon. There are 318 curves in this 11 mile stretch of road in North Carolina & Tennessee. Have you wondered if you could handle the Dragon? I know I have. This video will show you the techniques you need to ride a large cruiser on the Dragon or any piece of challenging tarmac with twisties, switch backs and blind turns. Bring it on! Excellent crash footage of fools on rocket bikes riding over their skill level included for your pleasure. Filmed mostly by Yellow Wolf Videos. Click here to see the trailer at YouTube. I liked watching this DVD, but I recommend it as a companion to Ride Like A Pro. This is like a bonus chapter. If you learn the skills and go out and apply them in the twisties then this DVD really doesn’t teach you more but it does illustrate how to use the techniques in real life. If you are susceptable to motion sickness do not watch this. If you want to get your hands on anything you can that will make you a better rider then get this DVD. What won’t kill you will make you stronger. Since Jerry dropped the jokes in this video, it won’t kill you! Click here for more information on this and other Ride Like A Pro DVD’s.